The price you found is 28% lower than this hotel's average rate of $167/night. The price you found is 28% lower than this hotel's average rate of $225/night. The price you found is 31% lower than this hotel's average rate of $580/night. 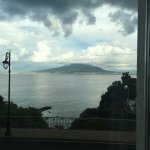 Gorgeous views, friendly staff & clean rooms await for those who stay at the Hotel Astoria in Vico Equense. This place was a great hotel. Very clean, recently renovated, and easy to get to Naples or Sorrento by train - the station is a quick 2 minutes away. Great local restaurants and spectacular views in Vico Equense - Highly recommended! The entrance was very beautifully designed and the receptionist was super friendly and talkative. He gave us a great recommendation for dinner and told us a lot about lifestyle here and in different cultures. Very nice! The room was a bit shallow, no decorations but it will be redone in November so that's okay. It was still a very nice room and the beds were comfortable, the only downside was the small back road next to the room which resulted into loud moments. Breakfast was okay, not super special but had everything we wished for. Bacon and scrambled eggs, juices, hot drinks, fresh fruit, sweets and salty things like ham, cheese, mozzarella, etc. Booked this hotel for a short break and wanted to be between Pompeii and Sorrento. Hotel from the outside does not give a true representation of what a little gem this hotel is. Having recently been refurbished the hotel is light and modern inside with excellent service from all staff. The rooms were cleaned meticulously by the maids including the balcony and furniture. Breakfast was buffet style with plenty of selection to have as much or as little as you needed, with a good selection of drinks too. The terrace had a stunning view over the bay and citronella candles were lit at night to keep the mosquitos away. Ideal location to get about as train station a stones throw away. (Trains could not be heard in the hotel). Vico Equense is a quieter location than Sorrento with shops closing for the siesta. As mentioned in other reviews, wifi was problematic for us too. If phones or tablets went into sleep mode you had to keep signing in. We had an evening flight home and check out was 11:00. We asked if we could pay to keep one of our rooms longer but unfortunately they were all booked for other guests arriving. They then found us another room to use free of charge just for our family, excellent service. Overall a great place to stay as a base with good service from staff. Thank you for making our stay pleasant. The rooms were much like the reception, newly decorated and stylish. Crisp linen on the beds and fluffy white towels in the bathroom. The breakfasts were extremely tasty and buffet style so you could have as much or as little as you desired. The coffee was particularly good and the maitre d was always on hand to help and go out of his way to serve you. The absolute gem of this hotel is Luca. Nothing is too much trouble for him and whatever help or assistance you need, he is always on hand to go out of his way for you, over and above the norm and I can't praise him highly enough. He phoned around for us when we needed to hire a scooter and even walked up the road with us and came in the hire shop to try and secure our booking. He is the most amazing guy. The same can be said for the family who look after guests on the beach, shuttling you up and down in a bus on the hour and doing everything they can to make your stay perfect. Perfect - beautifully refurbished hotel; incredibly friendly and helpful staff. Gorgeous view, short walk to train station, and free shuttle bus to beach and waterside restaurant and bating pavilion run by same family and their chocolate Labrador.